Two years after her injury, Um Mohammed had started to recover. However, just when her health was beginning to improve, her husband was injured in an airstrike, and thus lost his ability to walk normally. Um Mohammed's tale began with the siege that prevented her from seeing her children who live outside the besieged area of Eastern Ghouta, near the Syrian capital Damascus. While attempting to bring bread to her grandson from the nearby checkpoints belonging to the Syrian regime, she was shot in the abdomen by a Syrian government Sniper. The Syrian government had not only banned people from entering or exiting the area; they also blocked the entry of simple life necessities, such as food, water, medication, and fuel. Um Mohammed, 62 years old, is originally from Aleppo but has lived with her husband in Eastern Ghouta for more than 30 years. Um Mohammed has started a new chapter of her life; she must perform rehabilitation exercises with her injured husband, and shoulder the responsibility to provide for the needs of her destroyed house. Despite all this, she did not give up in the face of tough circumstances. Instead, she has set aside a room in her house in which she farms chickens as a source of food and income. In spite of her age, Um Mohammed attends a literacy class, where she learns to read and write in Arabic alongside other women, all of whom are trying to overcome a harsh situation. Even the teaching center has been shelled several times. Throughout the month which I intermittently spent with Um Mohammad, she was sincerely paying close attention to and looking after her husband. Despite the difficulties that his deteriorating health have posed, she truly loves him. Syria is not just black or white, Syrian regime or fighters. There are also civilians who are stuck in the middle, silently suffering the effects of this dreadful war yet doing their best to resist its bitterness. In my opinion, the resistance of Um Mohammed -- her devotion, determination, and desire to live and learn -- is representative of real Syrians. 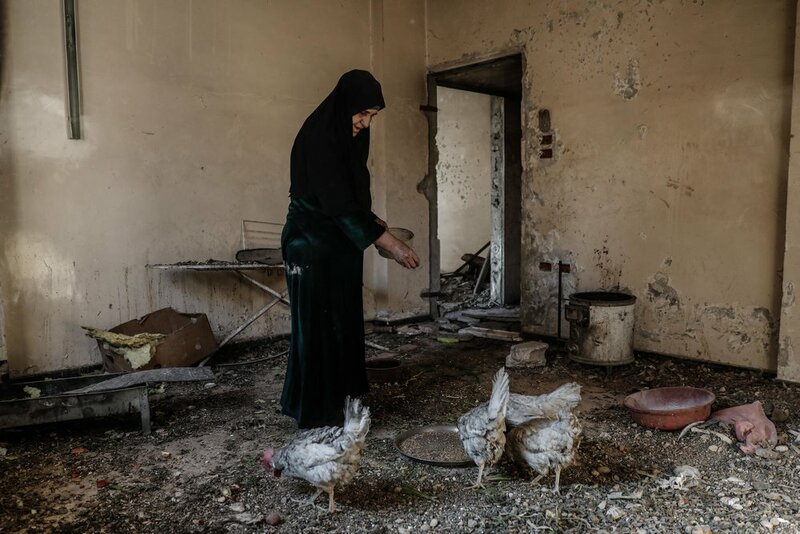 Um Mohammed, feeds her chickens at her home in the rebel-held town of Douma. Um Mohammed, performs rehabilitation exercises with her war-injured husband at their home. Life has a different taste in the besiegement! The word "siege" takes on a completely different meaning once you have experienced it. In Eastern Ghouta, life became increasingly daunting and unbearable as the siege tightened. Back in late 2012, the whole area became liberated by opposition fighters, and the government officially lost control. The Syrian government has imposed a severe siege on the area as a kind of punishment, attempting to regain control over the area by starving and bombing the people there. Primarily, the regime has restricted the movement of civilians, confiscated food, and arbitrarily deprived civilians of electricity and water. The siege of Eastern Ghouta passed through phases of loosening and restriction for over five years. This ended when the Syrian regime invaded the area after a brutal military campaign earlier in 2018, which was backed by Russian forces and involved heavy shelling. The most difficult period of the siege began in late 2013, when the Syrian regime and its allies imposed a complete siege on Eastern Ghouta. In August 2013, the regime launched a massive chemical attack on the area. More than 1,400 people were killed, most of them civilians. In the face of such a brutal campaign and with little experience with such a tight siege, people did not have time to make a plan; they were not well prepared to deal with the situation. Lands had not been farmed, and an adequate amount of food had not been stored. The situation escalated suddenly, and civilians found themselves face to face with the harsh reality that there was no food in the entire area. They thus began to search for alternatives that could help them to survive. However, after a long period of siege and starvation, people began to devise alternatives in order to cope with the devastating situation. Unfortunately, there were few items that could serve to replace food. People started using animals' fodder as a surrogate for wheat in order to make bread. It was even a luxury to acquire animals' fodder -- only the wealthy were able to get it, after paying a steep price and waiting in line for hours. Saccharine was used instead of sugar as some of it was stored. One of the main sources of sugar was a traditional sun-dried apricot paste, known as Kamruddin. The situation was extremely tragic, as children and the elderly began to die of starvation and from acute malnutrition. They started cutting trees down, to use the wood as a surrogate for fuel, and thus were able to make fires for cooking and heating. Because of the huge dependency on firewood, they began to produce stoves that were made specifically to work on wood rather than fuel. They started producing fuel and gas from plastic waste materials; however, this process was very expensive, and not very effective. People were cut off from the outside world due to the siege, thus, the internet was the only solution to connect with their children, relatives and to hear the news about what is going to happen to them. Getting the internet was not an easy mission, people dependent on local internet providers who, in turn, depended on satellite internet. Sometimes people managed to receive signals from cell towers in regime-controlled areas near Ghouta, using the cellular network for internet. The people of Ghouta have devised many alternatives to mimic the activities and products of daily life, attempting to resist the horrors of war, survive in such a bitter situation, and hope for a better future. known locally as a "sobia", in the city of Douma. A man puts the internet Modem at a high altitude in order to try to get some signal from nearby regime areas. The world's decision can change the reality of war! From teardrop to laughter, smile to weep, joy to sadness, happiness to fear, and from life to death. All these things shift in no particular order within twenty four hours of war. This has become the reality of daily life for Syrians living in their war torn country, especially children who become the main victims of this conflict. 24 hours of war aims to show the pace with which the war moves in less than a day, from children playing at a playground to children at a morgue. Making the flow of normal life impossible in the rebel-held and Syrian government besieged town of Douma. February 27, 2016 marks the first day of ceasefire in Syria. It was the first day where people did not hear the usual sounds of shelling and bombing, and have not been subjected to bombardment and shelling. On this day the children of Douma took advantage of the calm and took out to playgrounds in an effort to live the freedom of childhood. However, this ceasefire was short-lived and the massacres of war restarted soon after. A war which started in twenty-four hours, ended in twenty-four hours and then came back to life again within less than twenty-four hours, throwing civilians into a constant loop of chaos, killing and breaks in between. Children play on a slide at a park in the rebel-held town of Douma, on the eastern edges of the capital Damascus on February 27, 2016, on the first day of the landmark ceasefire agreement. A boy lies in a hospital bed after he was injured following air strikes by Syrian government forces on the rebel-held area of Douma, east of the capital Damascus, on February 26, 2016. Experiencing a new kind of life! Due to the intensive bombing that targeted everything, especially buildings on the ground, people of Ghouta shouldered the responsibility of devising new methods to protect themselves in case of bombardments. They slowly found themselves living completely underground. As a safety step, they dug shelters under their houses, so that they could seek protection when the shelling intensified. When the Syrian regime began targeting childrens' playgrounds and thus killing many children, people began to build underground playgrounds as a safe space for children to play and experience normal childhood activities. Even the dead were not safe from the bombings, nor were the cemetery workers. As a result of the brutal acts inflicted by the Syrian regime, many cemetery workers have been killed on the job by either Sniper shots or missiles. A layered cemetery was built in order to provide a safer space for workers, and to make space for the burial of those being killed in increasing number by air strikes. 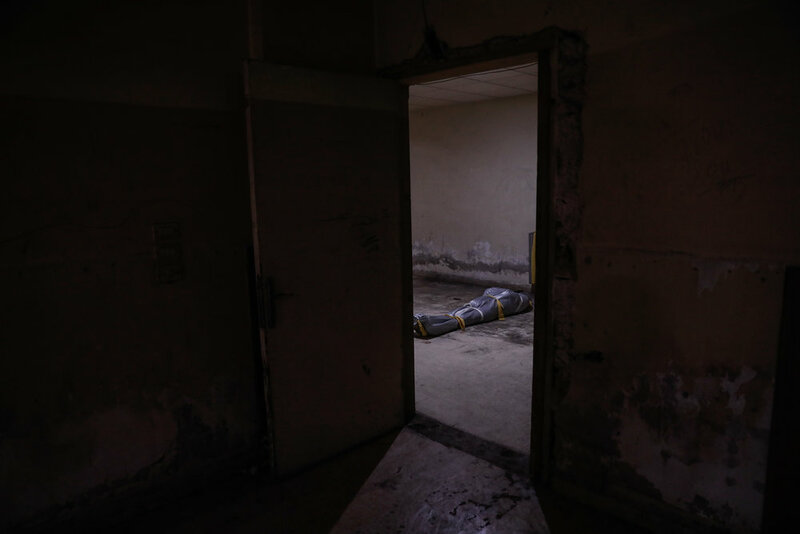 Schools was targeted in government forces air strikes resulting in the death of over a dozen students, the schools moved to an underground location for security reasons. The local administration and civil society founded in the liberated areas have also been forced to move underground for security reasons; the same goes for all facilities and health care centers. People of Ghouta, faced with the non-stop shelling conducted by the Syrian regime, did their best to devise as many alternatives as possible in order to survive. Children play in an underground playground built to protect them from shelling. A picture shows people cast their votes in an underground basement during the election of the local council. Men gather to bury the bodies of a family in a layered underground cemetery. A boy climbs into Abu Omar's shelter in the city of Douma, on the eastern outskirts of Damascus.